So its that time again, time to delve into the world of twitter and find a few morsels for our taste buds to tingle upon. The first comes from Sam, and is interesting as it unearths a little about what is to come for us fans. 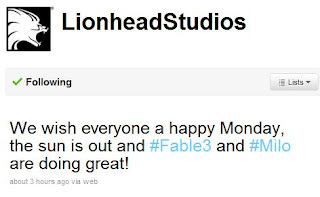 So basically the team is all gearing up for e3, possibly the biggest deal in gaming and this could be where we get to see a lot of more playable content from Fable III. Like last time when Fable II made an appearance we had a good length demo part for the press to walk through, and hopefully we shall see that again. As well as this lets hope for the Judgement mechanic being shown, as well as possibly some more combat and the relationship between player and npc happening to greater effect! Not only that but he mentions a 'VIDEO' which could be a new trailer for Fable III to be shown soon, or even the next Video Diary and filming more content for that. Both would be sound guesses. Plus, working hard in Fable III seems agiven and lets all send Sam some sweets! Second up is from Lionhead themselves and they too seem to be working hard. Fable III and Milo are going well, and thats all we could hope to hear. 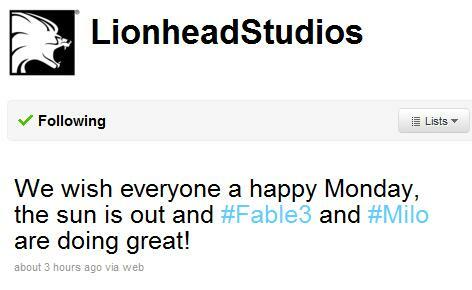 Keep the wheels turning lads and lasses of Lionhead, can't wait to see how its all going. AMAZING AND AWESOME INFORMATION !